Release and labeling of sialic acids with 1,2-diamino-4,5-methylenedioxybenzene.2HCl (DMB) for fluorophore detection of chromatographically separated sialic acid variants. Kit sufficient for 22 samples. For release and labeling of neutral and amino monosaccharides from glycoprotein therapeutics and pre-released glycans. This kit can be used for full quantitative or routine monosaccharide analysis. Sufficient for 96 samples. For labeling of free glycans with 2-aminobenzamide acid (2-AB). Sodium cyanoborohydride reductant. Kit sufficient for 24 samples. For labeling of free glycans with 2-aminobenzamide acid (2-AB). 2- picoline borane reductant. Kit sufficient for 24 samples. A new high throughput labeling kit for the labeling of free glycans with 2-aminobenzamide acid (2-AB). This kit contains 2-picoline borane as the reductant. Sufficient for 96 samples. 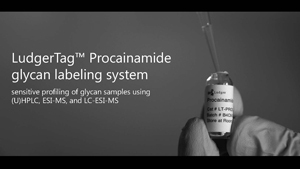 For labeling of free glycans with procainamide (PROC) 2- picoline borane reductant. Kit sufficient for 24 samples. For labeling of free glycans with procainamide (PROC) sodium cyanoborohydride reductant. Kit sufficient for 24 samples. For labeling of free glycans with procainamide (PROC) sodium cyanoborohydride reductant. Kit sufficient for 96 samples. For labeling of free glycans with 2-aminobenzoic acid (2-AA). Sodium cyanoborohydride reductant. Kit sufficient for 24 samples. For labeling of free glycans with 2-aminobenzoic acid (2-AA). 2- picoline borane reductant. Kit sufficient for 24 samples. To enable release of N-glycans from glycoproteins, N-glycan labeling and clean up within 1 hour for a single sample / 2 hours for 30 samples. Each kit contains PNGase F, V-Tag fluorophore dye, reagents and SPE cartridges, sufficient for up to 30 samples. 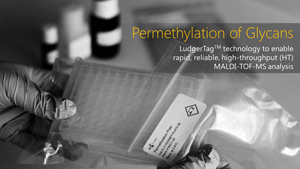 Due to shipping restrictions in some countries, the LudgerTag permethylation kit is also available without methyl iodide (synonym: iodomethane). 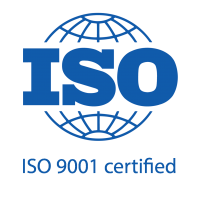 If ordering LT-PERMET-VP96 we recommend purchasing methyl iodide with purity =99.0% (GC) from your local chemical provider. CAS Number : 74-88-4. 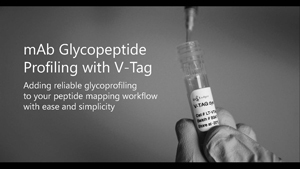 For labeling of IgG glycopeptides with VTAG and enrichment with SPE cartridges. Kit sufficient for 24 samples.